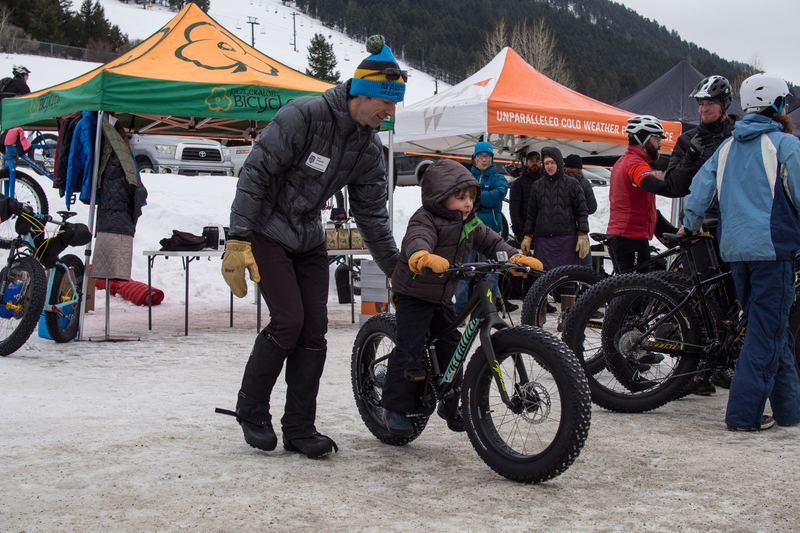 The three of us brothers took a road trip up to Jackson, Wyoming this past weekend for the Fat Bike Summit. It’s a five hour drive from where we live in Utah. 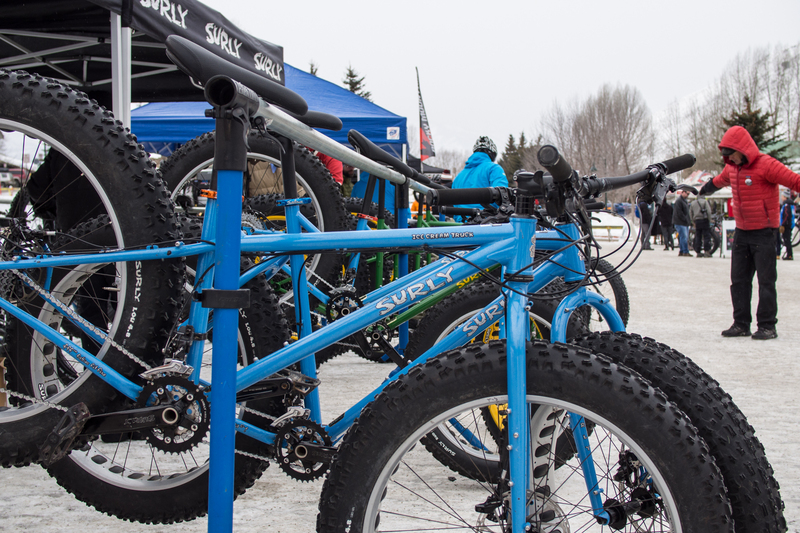 We had a great weekend riding, drooling over the latest and greatest fatbikes, chatting with fellow fatbikers, and eating too much. We arrived on Friday afternoon, checked into our motel, and promptly changed into our riding clothes. 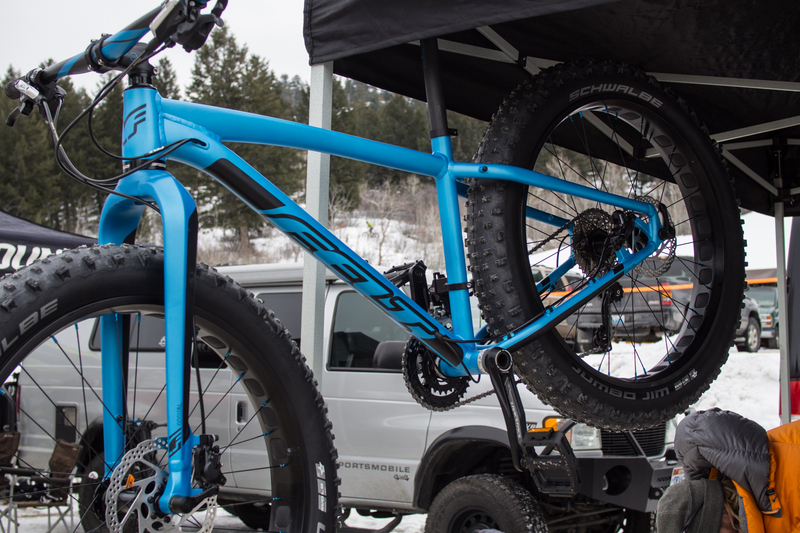 We drove over to Snow King Resort to get some help finding some trails. 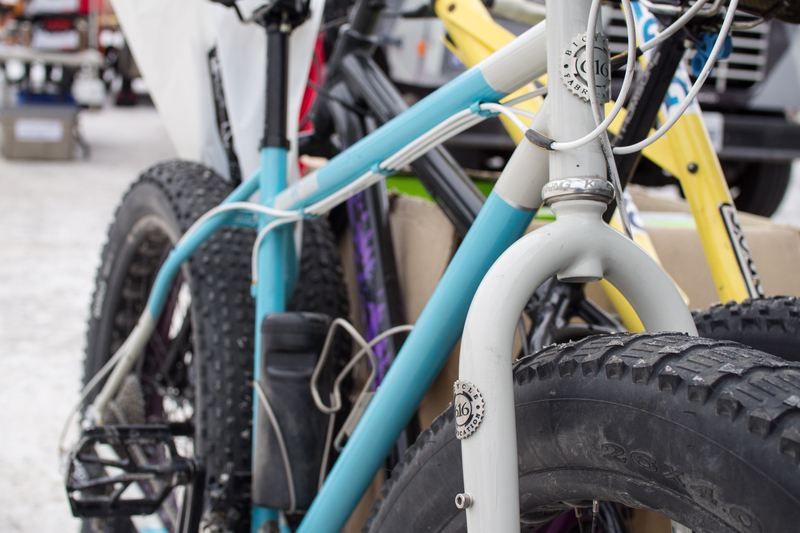 We ran into our friends from our local bike shop, Mad Dog Cycles, who were also a sponsor for the event. We were directed to Cache Creek. From Snow King we had to ride about two miles of iced over roads, which were pretty sketchy. 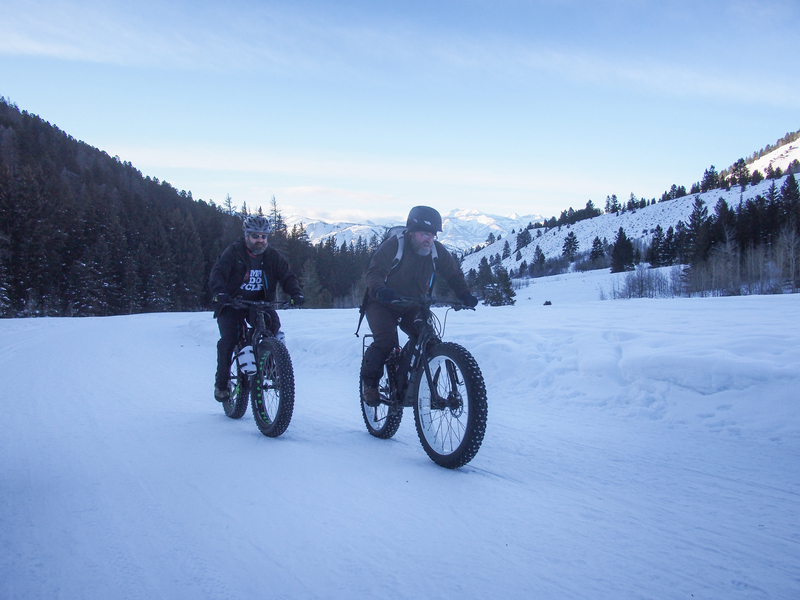 We then rode up Cache Creek Canyon on groomed track. 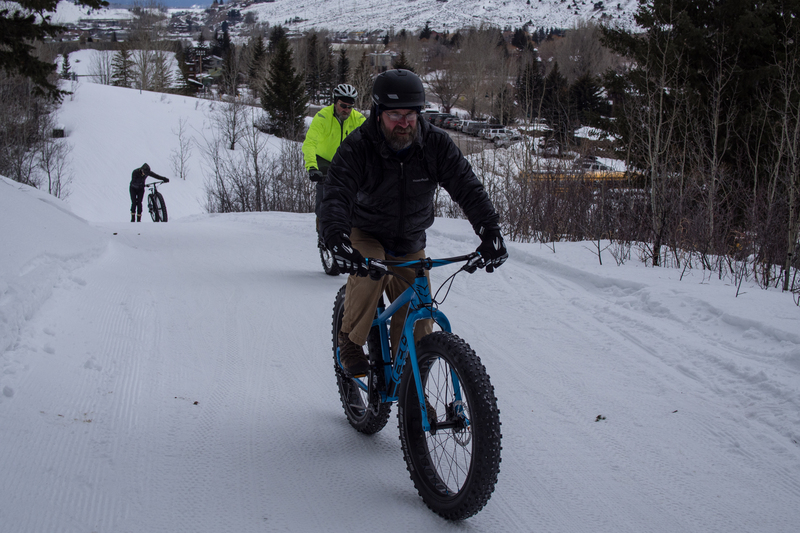 We shared the trail with cross country skiers, people walking their dogs, and other fatbikers. The trail was hard and firm. 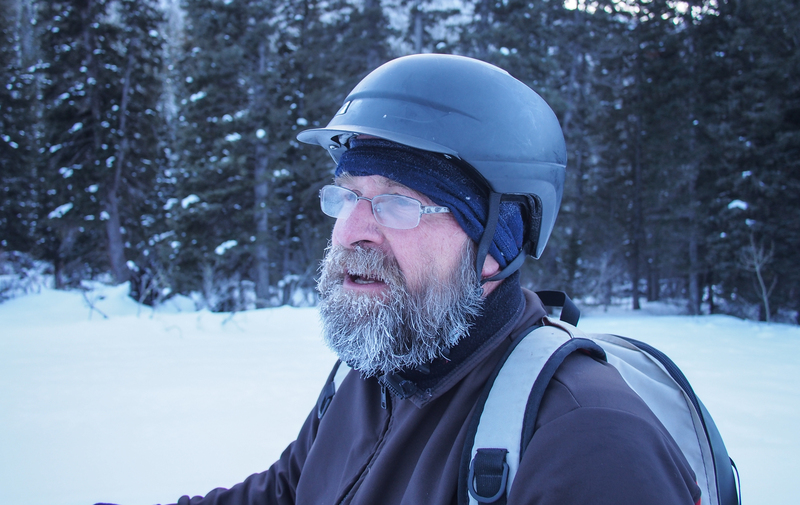 We rode to the end of the groomed portion then on up a narrower snowmobile track. 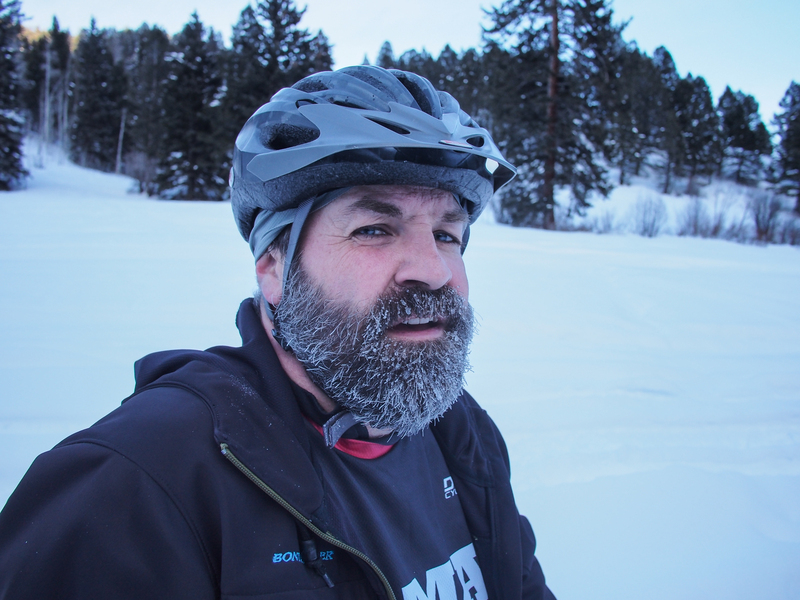 It was quite cold, 16 degrees down in town, so probably a bit colder up the canyon. The ride down was fast and fun, though pretty chilly. It seemed pretty humid as well, which always makes it feel colder. Heading up the Cache Creek Trail. Saturday night we went on an organized night ride sponsored by Light and Motion. We all met at the expo area and headed back up to Cache Creek. This time we rode the Hagen Trail. It was beautiful packed out singletrack. 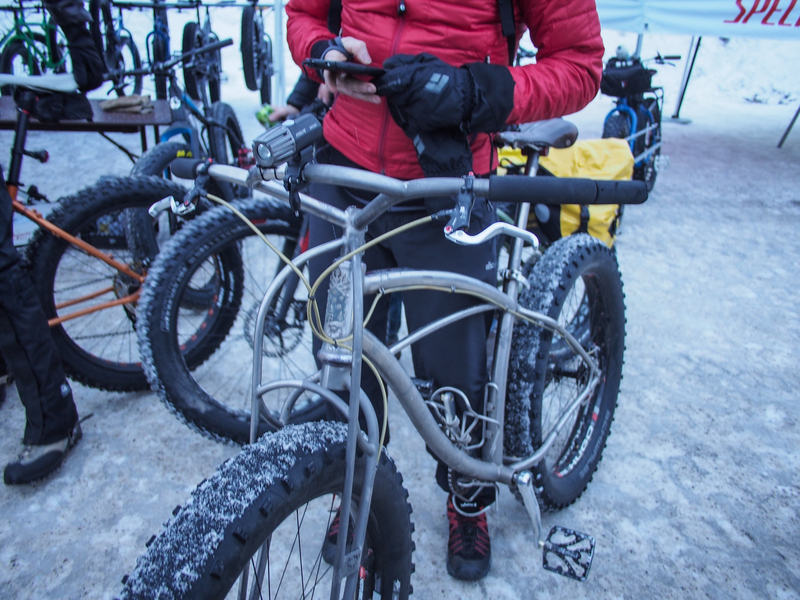 There were about 35 riders, many of them borrowing lights from Light and Motion. 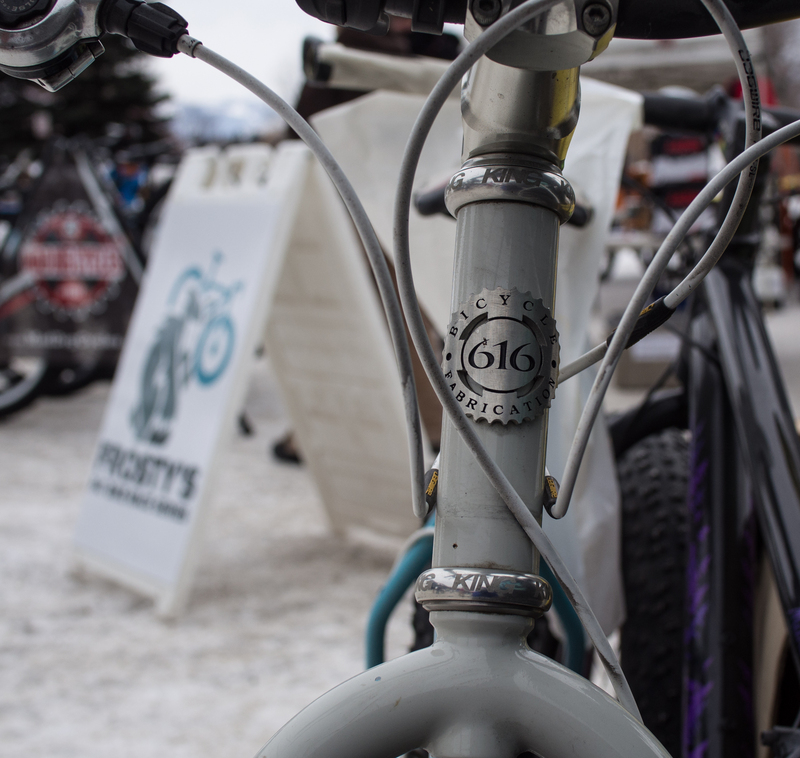 It was pretty surreal pedaling up packed singletrack winding through aspens and pine trees at dusk with a lightly falling snow. 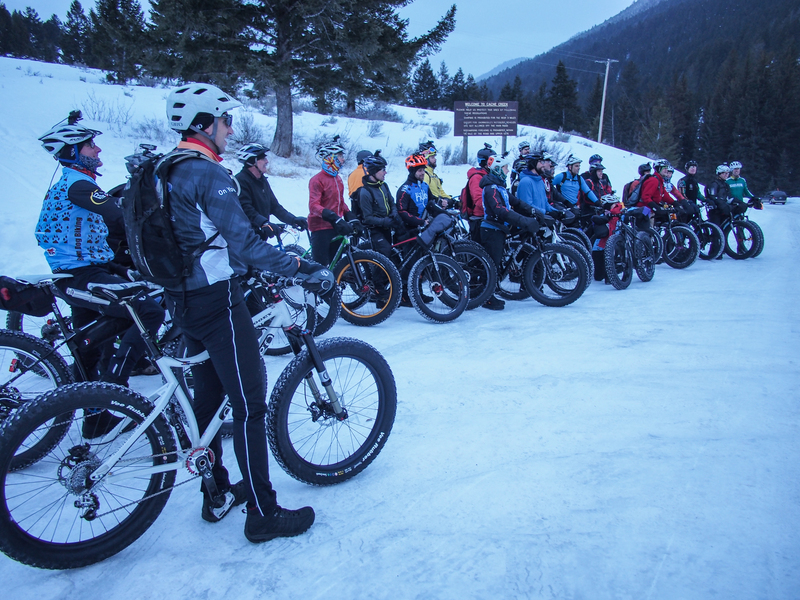 Instead of riding the road back to Snow King, about 7 or 8 of us decided to take a trail back to the resort. There was a fair amount of climbing before the trail finally dropped down switchbacks to the edge of the resort. 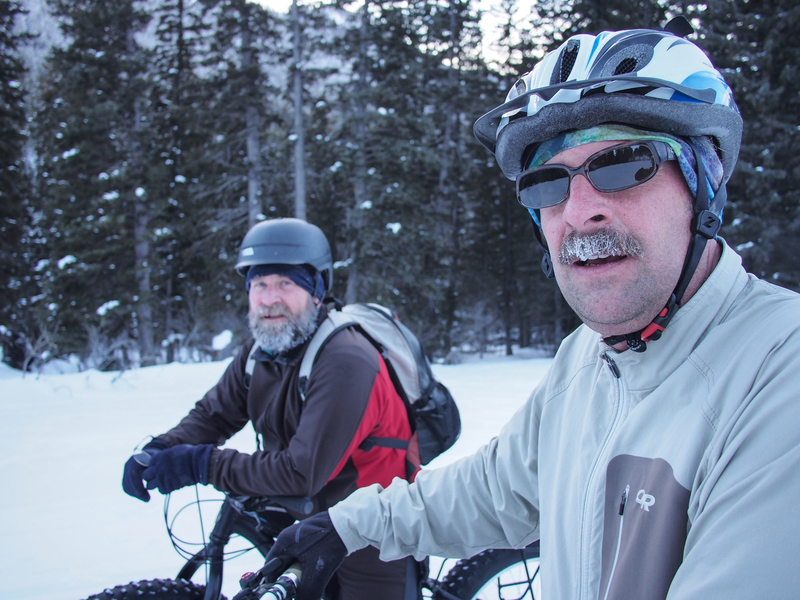 We still had to ride a bit of road, but not as much, and we added a few miles of great singletrack to the ride. It was a fantastic ride on great trails. 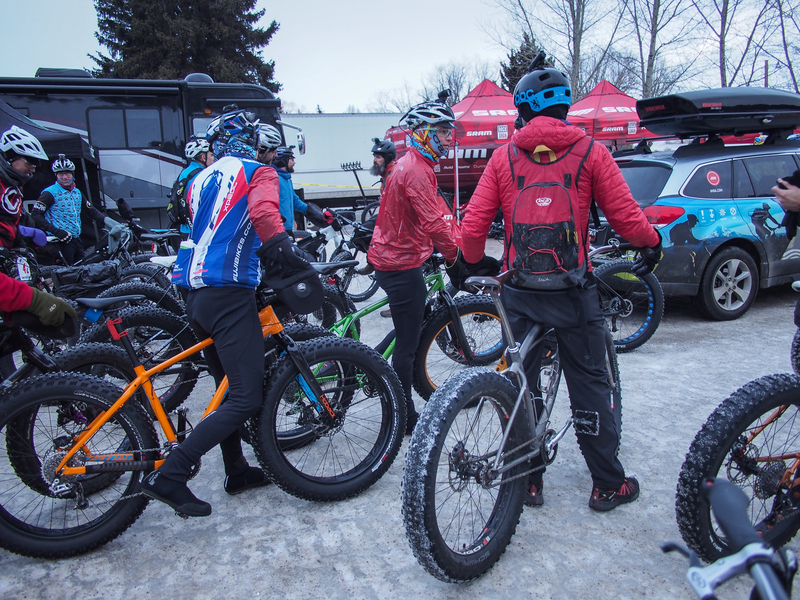 We heard that the days before we all arrived, volunteers were shoveling out the trail for us to ride. Many thanks to those volunteers; it was a memorable ride. Assembling for the group night ride. 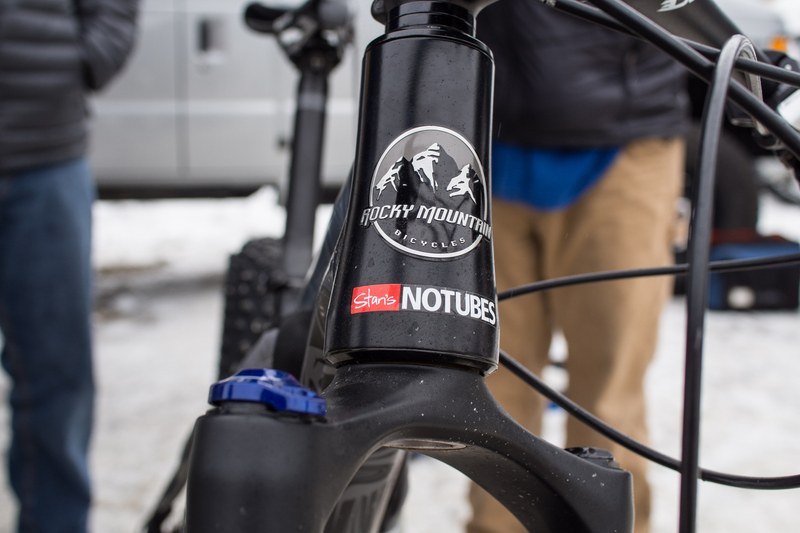 Getting ready to hit the singletrack. There were more dealers this year than last. 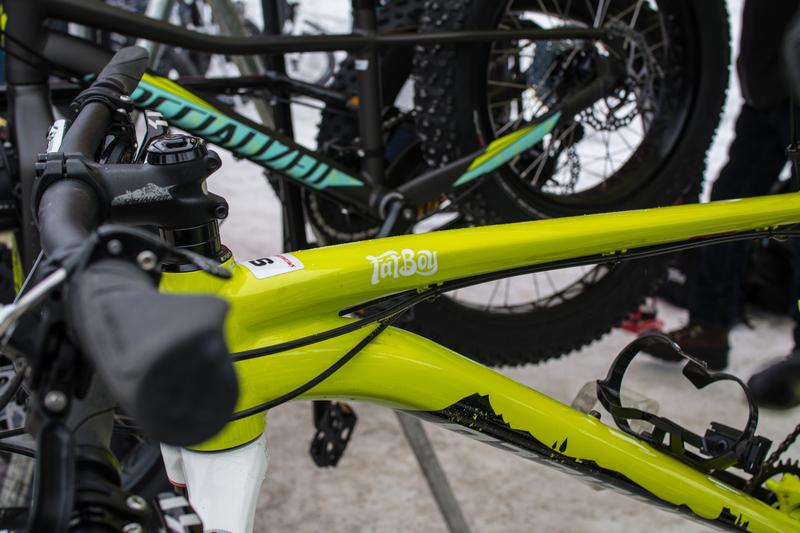 We spent Saturday morning wandering around the expo area and riding demo bikes. 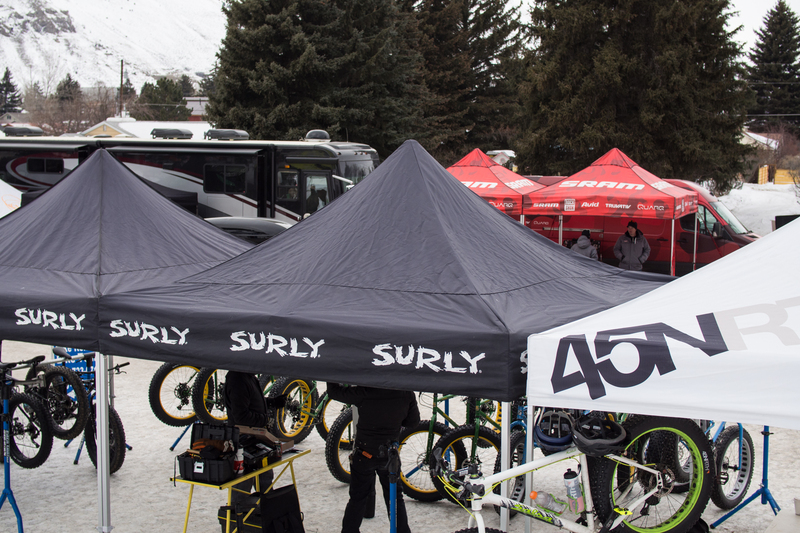 We saw booths from QBP with a Surly tent and a Salsa tent, and a 45Nrth tent, Trek, Specialized, Rocky Mountain, Felt, Sram, Borealis, Mad Dog Cycles, Fitzgerald’s (a Driggs, ID bike shop), Hoback Sports (a Jackson bike shop; they had a whole fleet of Fatback bikes), and few other organizations. It was a nice turnout. 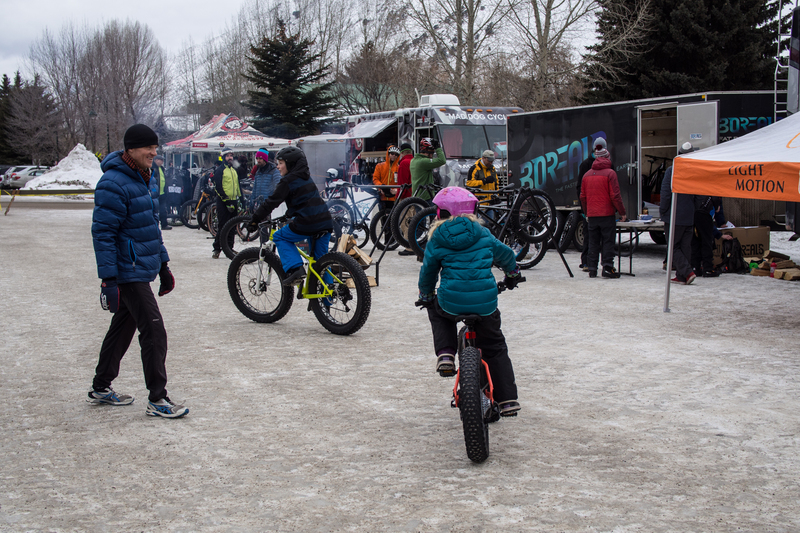 There was a short track adjacent to the expo area where you could demo the bikes. It had as a steep climb, a nice downhill, and some sharp corners, one with a nice built-up berm. 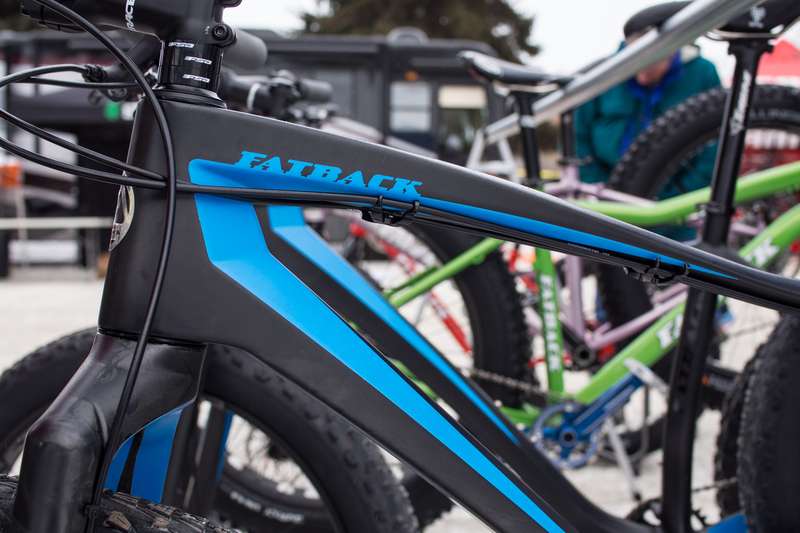 We rode a number of bikes, including a standard Felt, an electric assist Felt, aluminum and carbon Fatbacks, the Specialized Fatboy, Surly Ice Cream Trucks, and a Salsa Blackborow. 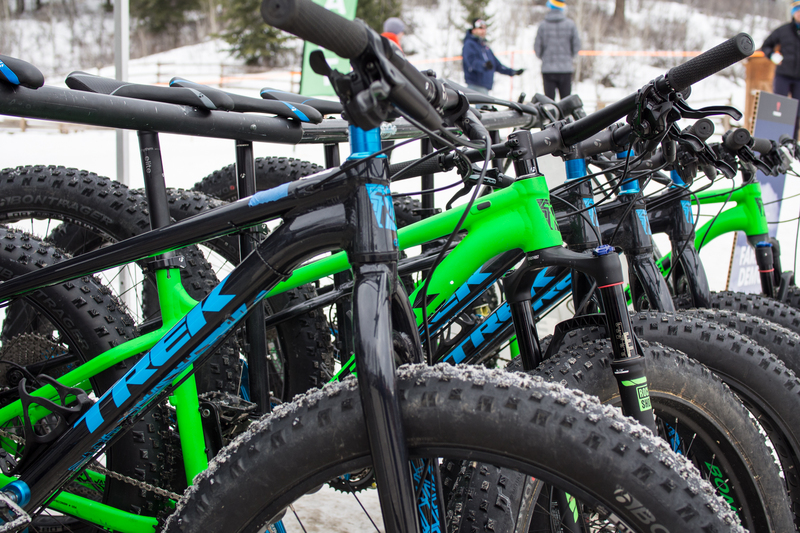 It was pretty fun riding all these bikes. 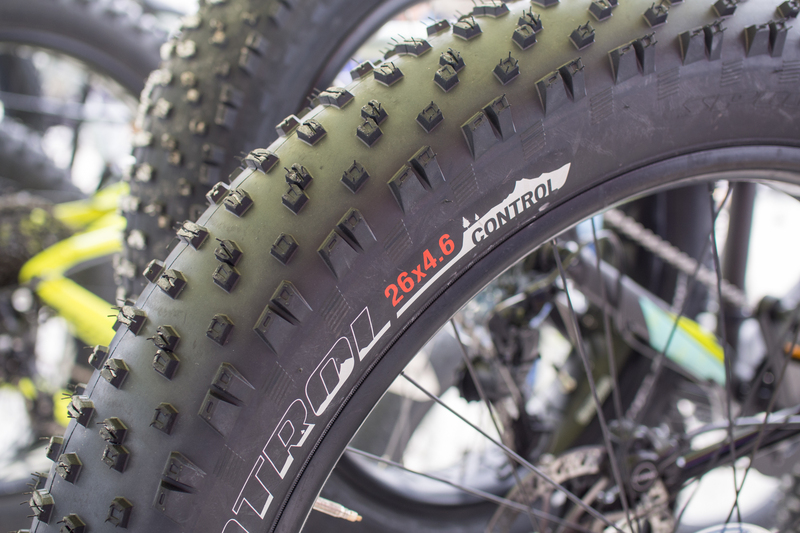 Doc and I both really like the ICT with it’s five inch Bud and Lou tires. It was also fun zipping around on the Felt electric assist bike as well. 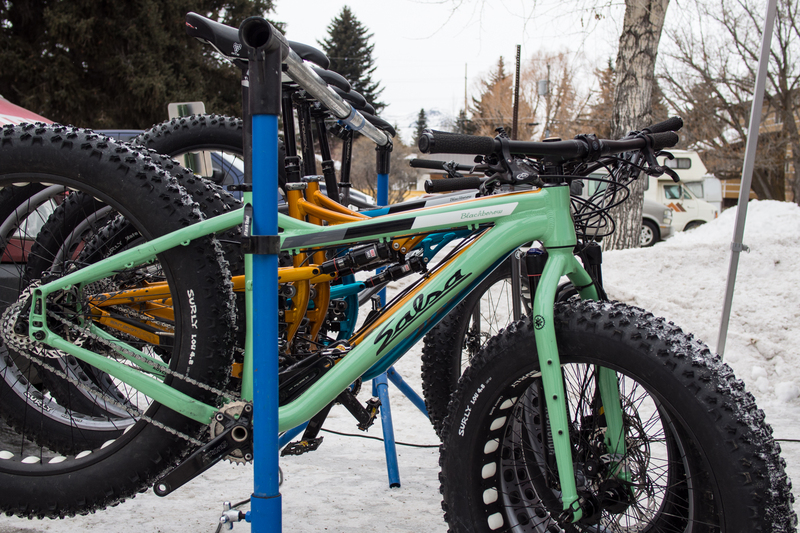 Below are some shots of the bikes. 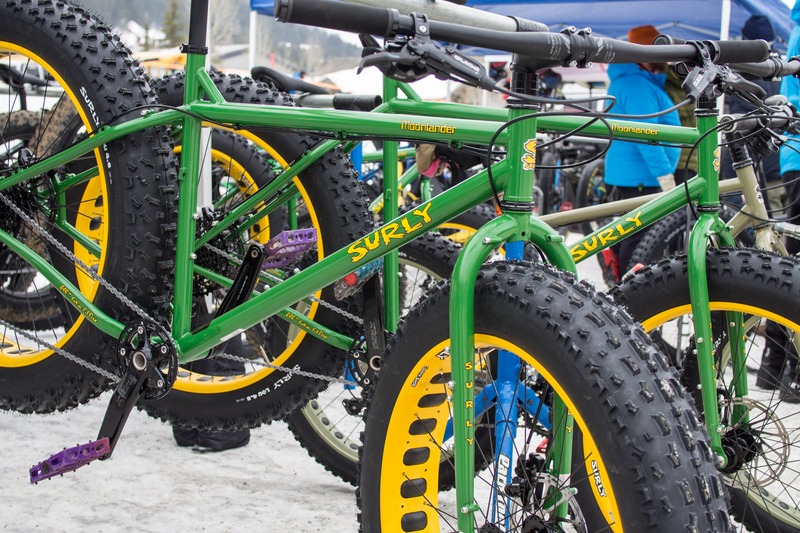 Surly Moonlander in John Deere tractor colors. 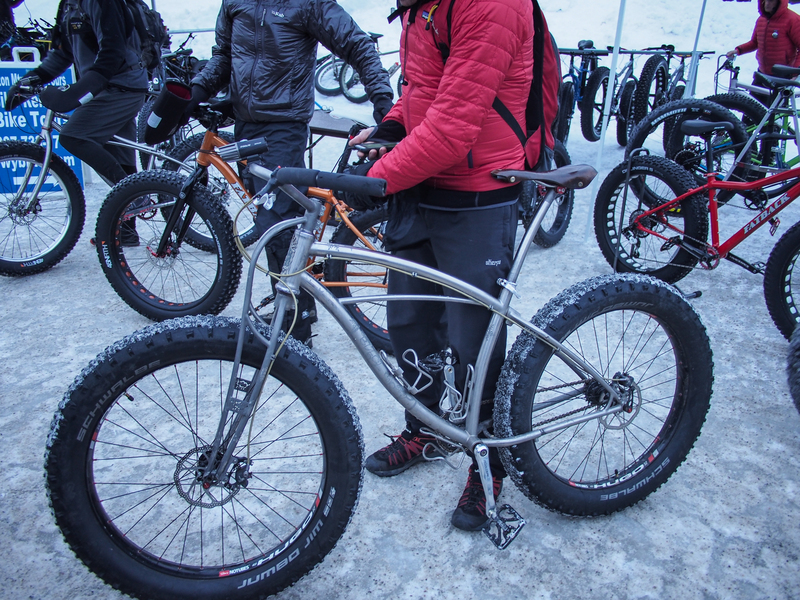 Bullet demoing a carbon Fatback. 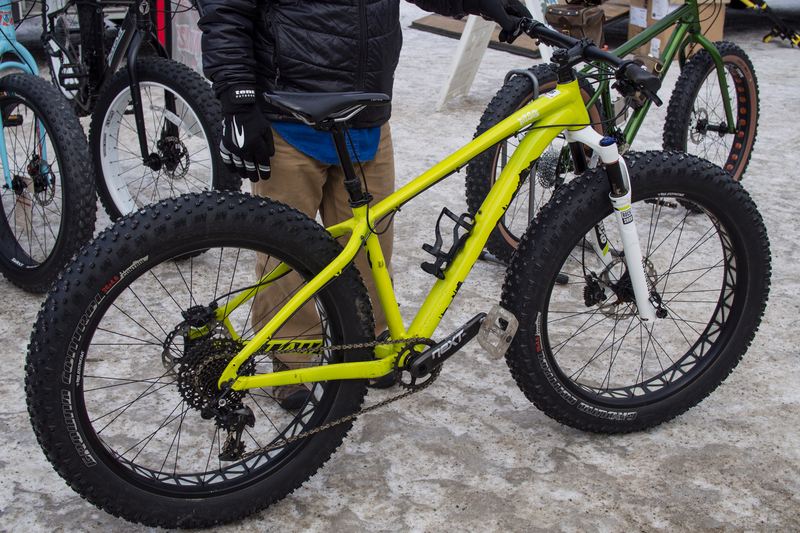 20″ tired Fatboy for the kids. 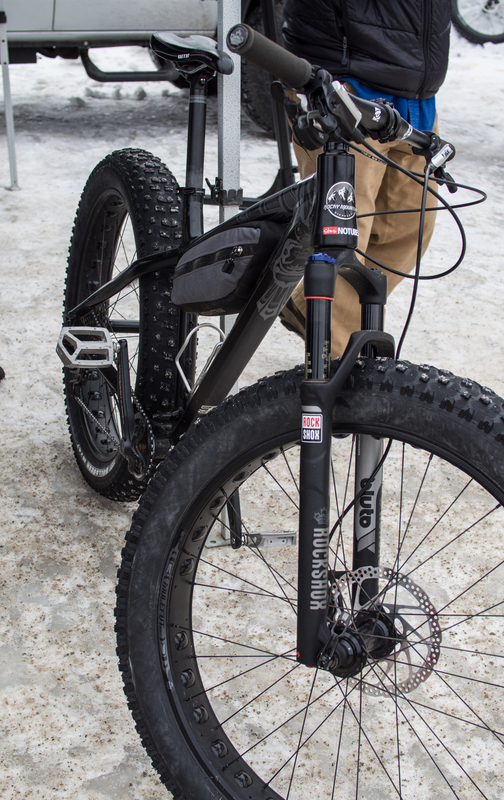 The Felt electric assist fatbike with Porcelain Rocket expedition panniers. 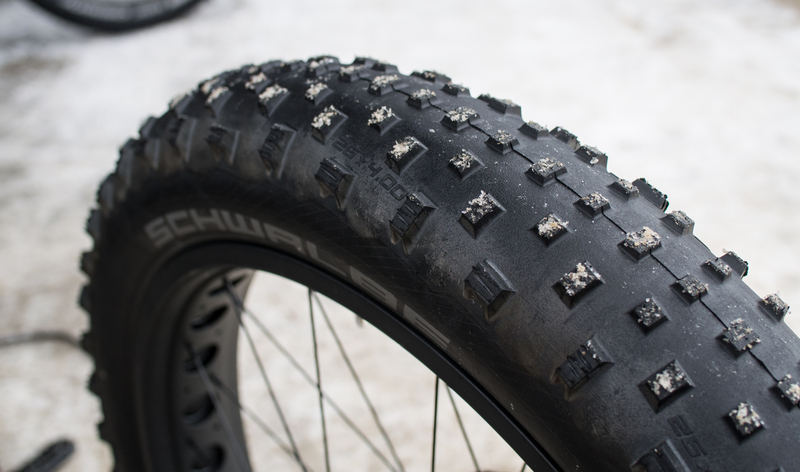 Schwalbe Jumbo Jim’s, which come on the Felt fatbikes. 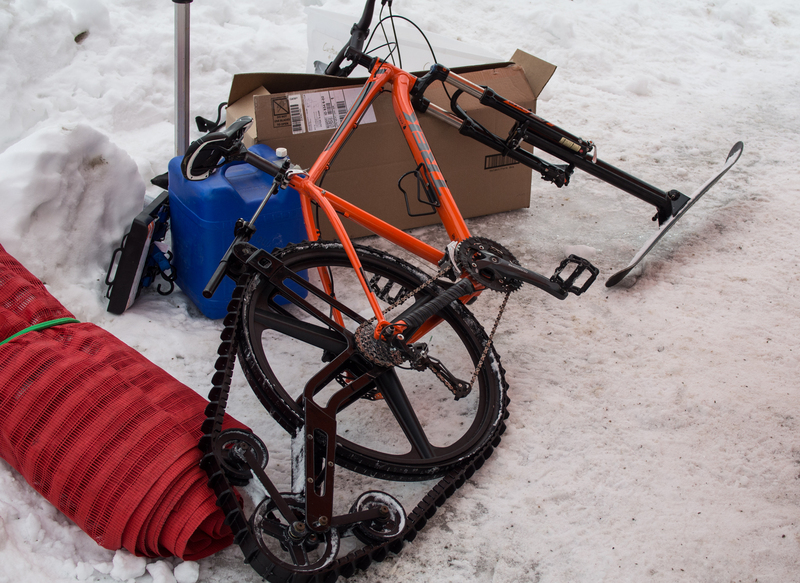 The Rocky Mountain Blizzard with integrated frame bag. 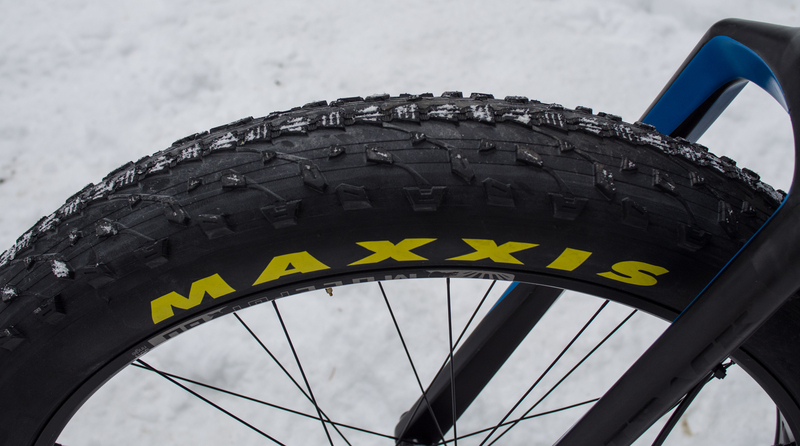 Maxxis fat tires—not very good in the snow. Not sure what to make of this. 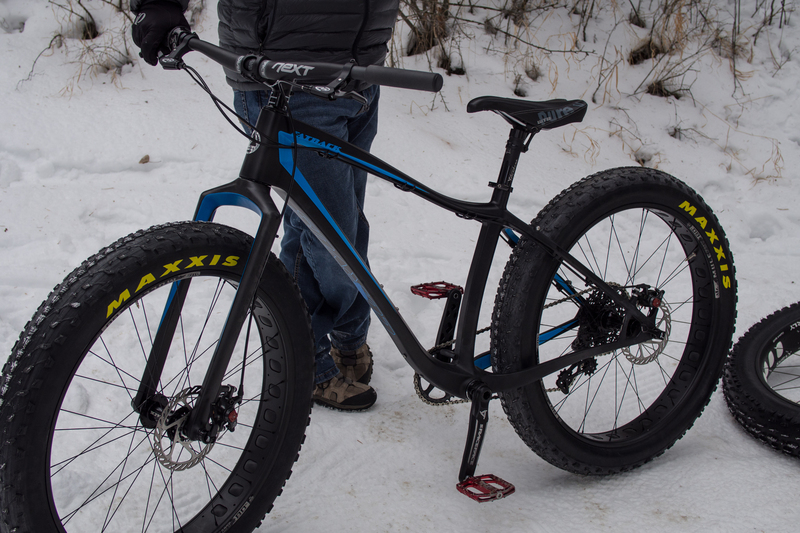 Doesn’t look as fun as a fatbike. 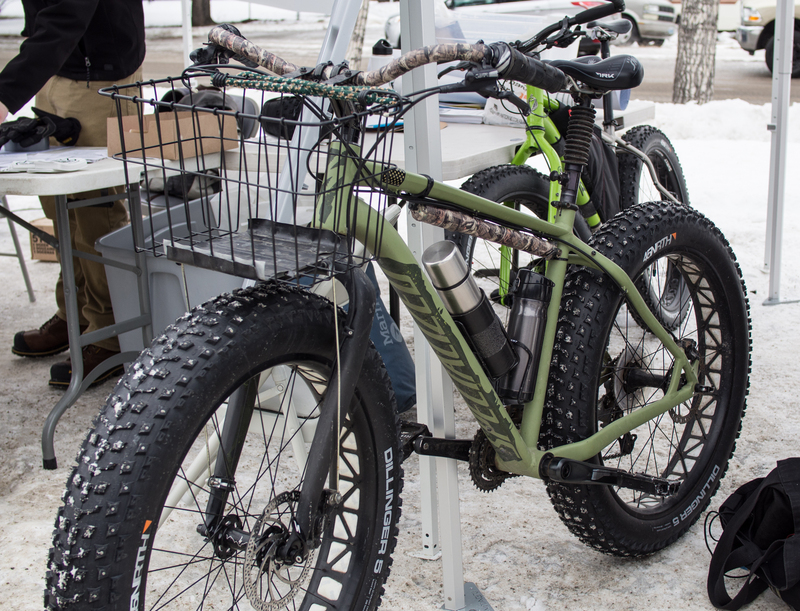 Titanium fatbike from Black Sheep Bikes in Fort Collins, CO.
Love that fork, Jones style. 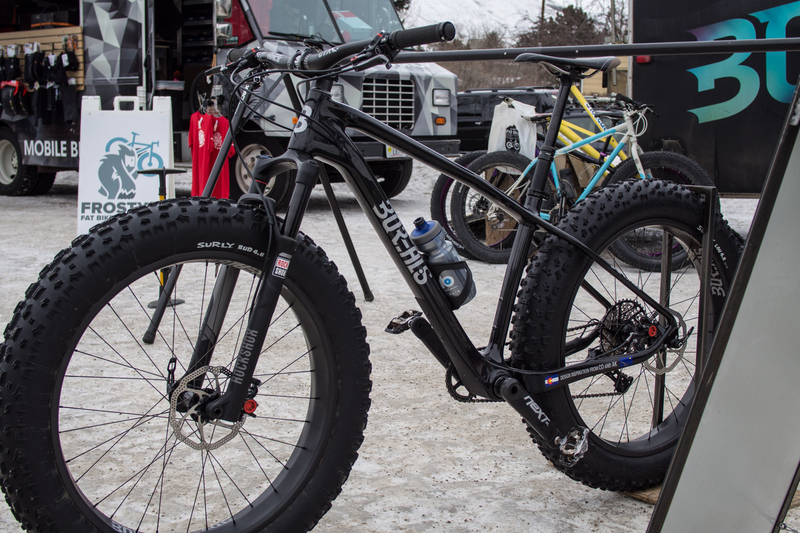 Beautiful steel-framed fatbike from 616 Bicycle Fabrications in Michigan. 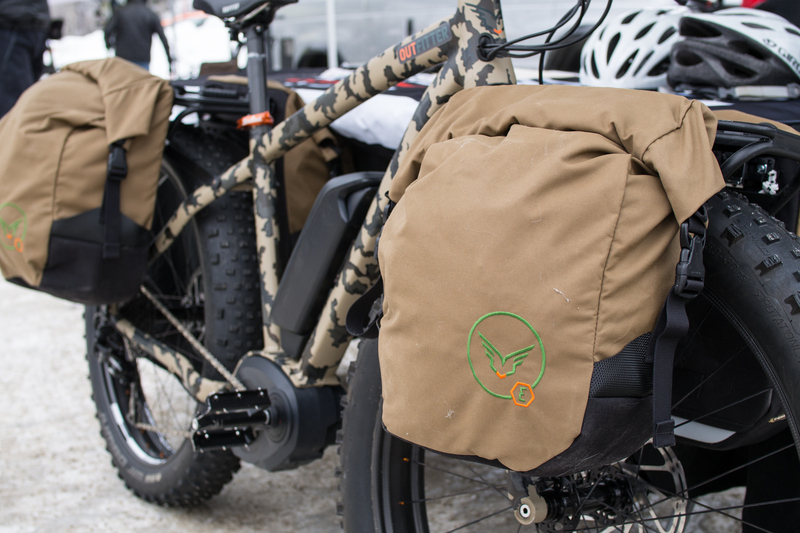 Kent’s Mukluk build (of Mad Dog Cycles), sporting Frost River waxed canvas bags. 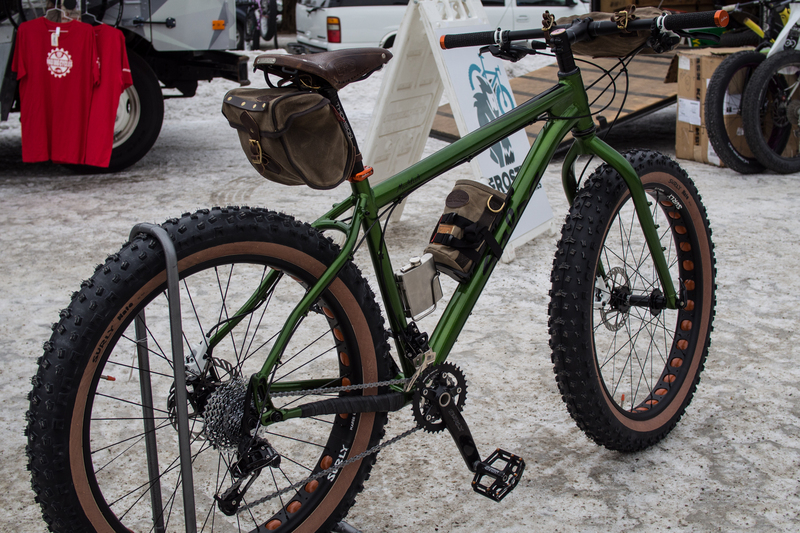 A Specialized Fatboy spec’d out for antelope hunting, really.